For more recent data on the religious composition of refugees to the U.S., read this post. More Christian than Muslim refugees have been admitted to the United States in the first months of the Trump administration, reversing a trend that had seen Muslims outnumber Christians in the final fiscal year under President Barack Obama, a Pew Research Center analysis of U.S. State Department refugee data has found. From Donald Trump’s first full day in office on Jan. 21 through June 30, 9,598 Christian refugees arrived in the U.S., compared with 7,250 Muslim refugees. Christians made up 50% of all refugee arrivals in this period, compared with 38% who are Muslim. Some 11% of these arrivals belong to other religions, while about 1% claim no religious affiliation. The religious composition of refugees to the U.S. has been shifting on a monthly basis as well. In February, Trump’s first full month in office, Muslims accounted for 50% of the 4,580 refugees who entered the U.S., and Christians made up 41% of arrivals. By June, Christians (57%) made up a larger share of arrivals than Muslims (31%). This stands in contrast to fiscal 2016, when a record number of Muslim refugees entered the U.S. and Muslims made up a higher share of admitted refugees than Christians (46% vs. 44%, respectively). However, the shift in the religious composition of refugees since January falls in line with longer-term trends: Between fiscal years 2002 and 2016, Christians outnumbered Muslim refugees in all but three years – 2005, 2006 and 2016. The religious affiliation of refugees has come under scrutiny since Trump first issued an executive order on Jan. 27 announcing restrictions on people traveling into the U.S. from seven majority-Muslim countries (Iran, Iraq, Libya, Somalia, Sudan, Syria and Yemen), a temporary halt of the U.S. Refugee Resettlement Program, and a new, lower cap on refugee admissions (set to 50,000 people annually). Legal challenges held up this executive order, but the U.S. Supreme Court recently allowed parts of the administration’s second version of the order, dated March 6, to take effect until the court hears the case sometime this fall. It’s not clear why the religious composition of refugees to the U.S. has changed since February. Trump’s revised executive order states no religious preference for refugee admissions. Also, it’s not yet known whether the religious composition of refugee applicants (not arrivals) has shifted during the Trump administration, since it is likely that many refugees admitted from February through June actually applied to the Refugee Resettlement Program before Trump took office (the refugee application process typically takes between 18 and 24 months to complete). Overall refugee admissions to the U.S. in fiscal 2017 (which ends Sept. 30) are on pace to fall below the 85,000-person ceiling established by the Obama administration for fiscal 2016, a year that saw 84,995 actual refugee arrivals. At the same time, arrivals for the current fiscal year are already nearing the new cap set by Trump in his executive order. As of June 30, the U.S. had already admitted 49,255 refugees. However, under the Supreme Court’s recent order, refugees with close family members in the U.S. may continue to enter the U.S. even after the new cap is reached. One important factor that influences the religious composition of refugee arrivals is country of origin, which has driven previous shifts in the religious affiliation of refugees. In fiscal 2016, for example, many Muslim refugees traced their origin to Syria, while in fiscal 2005 and 2006 an earlier wave of Muslim refugees arrived from Somalia. 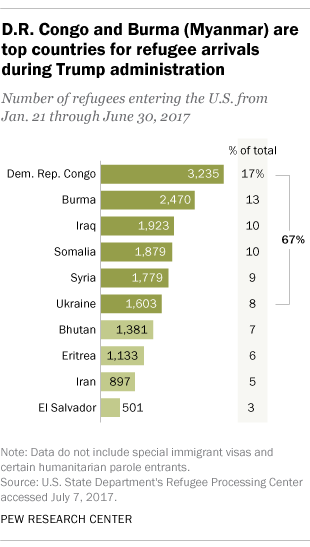 In the first months of the Trump administration, the top countries of origin for refugees have been the Democratic Republic of the Congo (3,235), followed by Burma (Myanmar) (2,470), Iraq (1,923), Somalia (1,879), Syria (1,779) and Ukraine (1,603). These six countries have made up two-thirds (67%) of all refugees entering the U.S. since Jan. 21, 2017. Of these, three are majority-Muslim origin countries (Iraq, Somalia and Syria). But since April – when Christian refugees topped 50% of all refugee arrivals to the U.S. – there has been a further shift. From April through June, Iraq is the only Muslim-majority nation among the top six origin countries. Other leading countries during this time have been the Democratic Republic of the Congo, Burma, Ukraine, Bhutan and Eritrea.